Moles are creatures that can be found in certain levels in Captain Toad: Treasure Tracker. The Moles are orange in color and have leaves like Turnips on their heads. 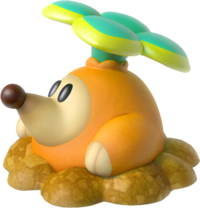 When found in levels, they will initially remain still next to a patch of Turnips, but when approached by the player will move around and have to be chased to catch them. When caught, they will give Captain Toad certain items like Super Gems, Super Pickaxes and Coins. This page was last edited on August 14, 2018, at 19:44.